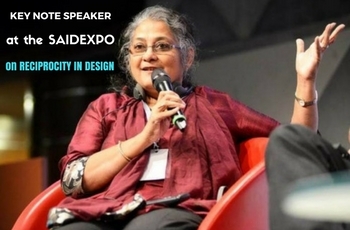 28 Apr 2017, Design Perspective: Sheila Sri Prakash, the Chief Architect and Founder of Shilpa Architects has been invited as the key note speaker for DESIGN PERSPECTIVE – Bangalore Edition. The Agenda of the event included Workshops, Brand Presentations, a Key Note Lecture by Ar. Sheila Sri Prakash and a Panel Discussion. Posted in Event Media .